Within the seven domains considered, how do service members compare with the general U.S. population and how do various subgroups within the active-duty population compare with each other on issues of health, health-related behaviors, and well-being? What are the policy implications of the 2015 HRBS findings? How might future iterations of the HRBS be improved? The Health Related Behaviors Survey (HRBS) is the U.S. Department of Defense's flagship survey for understanding the health, health-related behaviors, and well-being of service members. 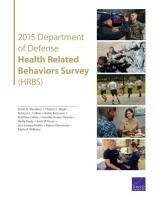 In 2014, the Defense Health Agency asked the RAND Corporation to review previous iterations of the HRBS, update survey content, administer a revised version of the survey, and analyze data from the resulting 2015 HRBS of active-duty personnel, including those in the U.S. Air Force, Army, Marine Corps, Navy, and Coast Guard. This report details the methodology, sample demographics, and results from that survey in the following domains: health promotion and disease prevention; substance use; mental and emotional health; physical health and functional limitations; sexual behavior and health; sexual orientation, transgender identity, and health; and deployment experiences and health. The results presented here are intended to supplement data already collected by the Department of Defense and to inform policy initiatives to help improve the readiness, health, and well-being of the force. 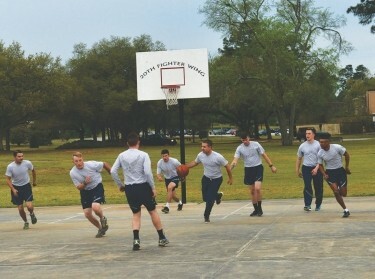 Active-duty service members met or exceeded Healthy People 2020 targets for physical activity. More than half of respondents reported using energy drinks in the past month, suggesting that the military may be at increased risk for misuse, which is associated with several adverse health outcomes. More than half of service members got less sleep than they need, and almost one-third were moderately or severely bothered by lack of energy due to poor sleep. We found that rates of binge drinking in the services remained nearly as high as in 2011 and were at a level high enough to cause concern. Rates of illicit drug use were substantially lower among service members than among the general U.S. population. E-cigarette use is a growing problem. Mental health problems remain a common concern and occur across all branches of the military. The prevalence of depression, anxiety, and posttraumatic stress disorder are higher in the HRBS population than in the general population, but demographic and other differences between these populations make it challenging to interpret these contrasts. The prevalence of specific chronic diseases (e.g., diabetes, high cholesterol, ulcers) among service members was relatively low compared with the general U.S. population. Unintended pregnancy rates are about the same among female service members than among civilian women and are of particular concern given the potential impact of pregnancy on readiness. And although most service members were tested for HIV in the past year, about one-fifth of those at high risk for HIV infection went untested in that period. Results indicate that lesbian, gay, bisexual, and transgender (LGBT) personnel get routine medical care in percentages similar to non-LGBT personnel. However, compared with non-LGBT personnel, they report more smoking, binge drinking, sexual behavior risky to their health, and adverse sexual health outcomes. The percentages of LGBT personnel reporting mental health issues, a history of unwanted sexual contact, and a history of physical abuse are particularly high. These disparities warrant close attention and tracking so that the subgroup's specific needs can be addressed. Service members with more exposure to combat trauma during deployments showed elevated rates of mental and physical health problems, as well as negative health-related behaviors (e.g., substance use) compared with their less-exposed peers. Based on the HRBS results, the behaviors and outcomes that warrant immediate attention are binge drinking, smoking and e-cigarette use, overweight and obese personnel, inconsistent use of contraception, those at high risk for HIV infection, sleep, absenteeism, and reduced productivity (presenteeism). The services should consider heightened scrutiny and continued monitoring of behaviors and outcomes related to mental health treatment and suicide. Results from the 2015 HRBS suggest that certain groups of service members warrant targeted intervention to prevent multiple negative health outcomes and to improve current behaviors. Given differences between members of the military and the general U.S. population, DoD, the Coast Guard, and the services should also consider establishing population benchmarks of health and health-related behaviors specifically for the military. Because the 2015 HRBS had a low response rate, we suggest that future iterations make some adjustments. Among them, shorten the survey, send invitations from a military email address, consider a confidential instead of an anonymous survey, offer incentives, and investigate the feasibility of a service member panel. Sarah O. Meadows @SarahOMeadows, Charles C. Engel @CharlesEngel, et al. This research was sponsored by the Defense Health Agency and conducted within the Forces and Resources Policy Center of the RAND National Defense Research Institute, a federally funded research and development center sponsored by the Office of the Secretary of Defense, the Joint Staff, the Unified Combatant Commands, the Navy, the Marine Corps, the defense agencies, and the defense Intelligence Community. Meadows, Sarah O., Charles C. Engel, Rebecca L. Collins, Robin L. Beckman, Matthew Cefalu, Jennifer Hawes-Dawson, Molly Doyle, Amii M. Kress, Lisa Sontag-Padilla, Rajeev Ramchand, and Kayla M. Williams, 2015 Department of Defense Health Related Behaviors Survey (HRBS). Santa Monica, CA: RAND Corporation, 2018. https://www.rand.org/pubs/research_reports/RR1695.html. Also available in print form.